"Hurricane Marketing has given us a steady stream of local, focused hits, with requests for quote for our services from local New York businesses." 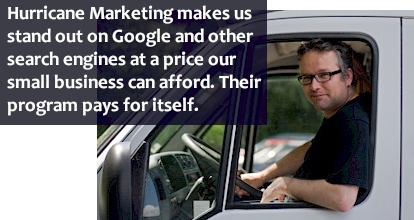 "Within six months we were on Google's (and others) first page." For long term search engine success, Hurricane Marketing will provide Search Engine Optimization (SEO) for your Home Page for your primary keyword phrase. Search engine optimization (SEO) is the most effective and low cost method to create high rankings for a business web site. Combined with regular monthly promotion from Hurricane Marketing, this optimization helps build your rankings on major search engines as fast as possible. Monthly Search Engine Marketing (SEM) efforts by one of our experienced Search Engine Specialists who manually submit your web site to major search engines including Google, Yahoo, MSN/Bing and well as directories, databases, and special interest sites that are related to your industry. These monthly efforts, combined with our search engine optimization (SEO) work to create and increase organic rankings across all major search engines. The SEO ACCELERATE Web Site Marketing Program generates high organic search engine rankings using multi-page Search Engine Optimization (SEO), Search Engine Marketing (SEM). Designed for growing companies with sales over $1 Million each year, the program is a powerful tool for generating long lasting organic (natural) rankings across multiple search engines including Google, Yahoo and MSN (Bing). The program includes search engine optimization (SEO) and Search Engine Marketing (SEM) for up to 10 of your product pages to build your web site's link popularity. In addition all of our standard services below are included.